Pakistan has successfully test-fired the Shaheen-III surface-to-surface ballistic missile, the press service of the Pakistani army said Friday. NEW DELHI (Sputnik) – The missile hit its designated target and its flight trajectory matched the given parameters, the press service added. The range capability of the Shaheen-III land-based missile, that can carry both conventional and nuclear warheads, is over 1,700 miles. Last year, Pakistan successfully tested the Shaheen-I and Shaheen-II missiles that can be equipped with both conventional and nuclear warheads. The range of the Shaheen-I is over 550 miles, while that of the Shaheen-II is over 900 miles. Pakistan declared itself a nuclear power in 1998 after carrying underground nuclear tests that followed those carried out by India. Pakistan's new Shaheen-III medium-range ballistic missile (MRBM) is carried by a Chinese-made 16-wheel transporter erector launcher (TEL), an Indian government source told IHS Jane's on condition of anonymity. The Indian source noted that Pakistan began negotiations in 2012 with the China Precision Machinery Import-Export Corporation (CPMIEC), which resulted in the export of "two 16x16 WS-21200s for use as TELs for Shaheen-III missiles". Pakistan is believed to have taken delivery of the TELs at the end of February or in early March 2016. The source also said that Pakistan's National Engineering and Scientific Commission has set up an assembly line at the Punjab-based National Development Complex to assemble TELs for Pakistani missiles. The WS-21200 - a previously unreported designation - is manufactured by the Hubei Sanjiang Space Wanshan Special Vehicle Co of the China Aerospace Science and Industry Corporation (CASIC). China provided WS-51200 TELs to North Korea in 2011, the Indian source stated. Six of these vehicles currently carry North Korea's KN-08 and KN-14 intercontinental ballistic missiles. "There is no doubt China is involved in the proliferation of missile technology," said the Indian official. The Shaheen-III's WS-21200 TEL and the WS-51200 used by North Korea have much in common, including the same headlight and direction indicator patterns. One main difference, however, is that the WS-21200 uses a forward-tilting windshield glass structure not used by the WS-51200. However, this glass structure is used by the 8-wheel TEL cab of Pakistan's Hatf 9 (also known as Nasr) 60 km-range tactical nuclear missile, which is virtually the same as the TEL cab of China's DF-11A short-range ballistic missile made by CASIC. 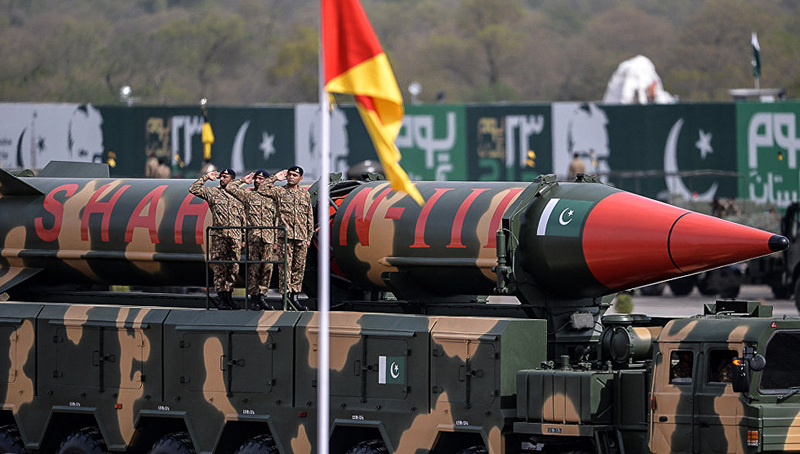 Revealed to the public for the first time during Pakistan's military parade on 23 March, the Shaheen-III - a surface-to-surface, land-based ballistic missile - is allegedly capable of carrying a nuclear or conventional warhead to a range of 2,750 km. Pak successfully conducted first flight test of SSM #ABABEEL, Rg 2200 Km. #COAS congrats team and Pak Armed Forces for landmk achievement. In the media reports on the topic of non-proliferation of nuclear weapons, reports about the head of the Pakistani nuclear program Abdul Kadyr Khane occasionally slip. It is widely known that in the 1970s. He took out secret data from the laboratory in Amsterdam on the production of nuclear weapons. Later, he took part in the trade in nuclear materials and equipment on the international "black market". Up to the present time, the leadership of Pakistan has been taking all possible measures to avoid interrogation of Abdul Qadir Khan by foreign investigators. With a thoughtful study of the facts related to this espionage story with the kidnapping and illegal trade in nuclear secrets, many questions arise to the West - to the US and to some European states. Thus, investigations into the case of A. Kadyr Khan were held in the United Kingdom, the Netherlands, Switzerland and Germany. They were non-transparent, and the results of the IAEA Board of Governors were not properly notified. In the UK, the 2004 investigation into Peter and Paul Griffins, suspected of organizing supplies of components of nuclear centrifuges and spare parts for them from Pakistan to Libya, ended in vain. The Griffins were not brought to justice. In the Netherlands, an investigation into the possible access of A. Kadyr Khan to uranium enrichment technologies during the work at the URENKO enterprise also had no practical results. Swiss citizens Friedrich, Urs and Marco Tinner were arrested in Germany in 2004 at the request of Berne and since 2005 have been under arrest. They were accused of trafficking in nuclear materials, including gas centrifuges, as well as money laundering. During the investigation, the facts of Tinner's cooperation with the CIA were revealed. As a result, under the pressure of Washington, the case was closed "for lack of evidence," and the accused were released. Three people were convicted in Germany in the case of A. Kadyr Khan. E. Piffle was sentenced to 3.5 years in prison in 1998 (he was charged with participation in the supply of frequency converters and components of gas centrifuges to Pakistan). R.Folmerich in 2005 was sentenced to seven years and three months of imprisonment (deliveries to Pakistan of equipment and raw materials for the construction of uranium enrichment facilities). G.Lerkh in 2008 was sentenced to 5.5 years imprisonment (production of components of the uranium enrichment facility in the interests of the Libyan nuclear program). In the US, criminal cases against those involved in the "network" did not start at all. Washington limited itself to including in 2009 A. Kadyr Khan himself and 12 other persons engaged in illegal trade in WMD components in the national sanctions lists. It is difficult to arrive at unambiguous conclusions on the case of A. Kadyr Khan, since not all the results of investigations are available in the public domain. But even those that are promulgated, suggest that the "secrets" of nuclear secrets from the European laboratory in the Netherlands are clearly not accidental, as well as further deals in the nuclear "black market".